Operate and configure Odoo’s ERP confidently with this “must have” Odoo accounting book for any successful Odoo Implementation team or project. This foundational book, Financial Accounting with Odoo, now on its third edition, has become the bible of the Open ERP accounting configuration industry, and is the most complete Odoo accounting guide for users. The book is written in the style of a guide and supports you hand in hand, with a simple cadence and step-by-step process through the configuring and running of the Odoo Accounting Module. Financial Accounting with Odoo takes the mystery out of the critical aspects of initial set up by providing a detailed and simplified approach to learning and becoming comfortable with Odoo accounting configurations. Starting with initial system setup and continuing through closing, reporting, and predictive accounting procedures, the book covers it all from A to Z.
Greg Mader, Odoo’s top USA Consultant, has created the book from the experience of hundreds of Open ERP accounting “rescue missions,” optimizations and corporate transformations with the Odoo software. Readers of this Odoo accounting book learn to configure Odoo’s Open ERP accounting module to produce accurate and complete results… the first time. 1. Learn everything you need to know about Odoo Version 11. The 3rd edition of Financial Accounting with Odoo includes information on the new features and functionalities of the latest version of Odoo. 2. Improve your inventory costing methods. The 3rd edition of Financial Accounting with Odoo will give you a clear picture of your inventory costing options and includes realistic examples of Average Costing, Standard Costing, FIFO, FEFO, and LIFO. 3. Empower your leaders to make better strategic enterprise decisions with Analytic Accounting. The 3rd edition of Financial Accounting with Odoo now includes an entire section on how to effectively use the Analytic Accounting feature of Odoo. 4. Regain control of budgeting in your business. The 3rd edition of Financial Accounting with Odoo shows you how you can manage budgets with Odoo's Analytic Accounting feature. 5. Discover if it's the right time to implement an Open ERP solution with Odoo. 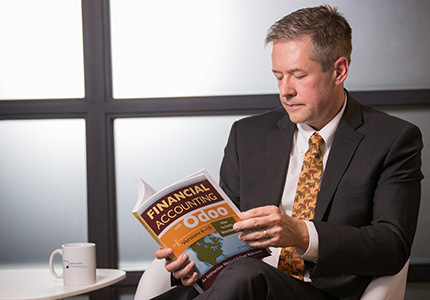 The 3rd edition of Financial Accounting with Odoo sheds new light on best practices for transitioning old or disparate systems into a new and unified system. Greg Mader has been a real-time accounting leader and industry innovator within the Open Source ERP sector for more than 25 years. His experience includes BPM/BPO, CRM, ecommerce, data integration, accounting, logistics and end to end manufacturing. He holds two master’s degrees: a master’s in geography from South Dakota State University, and a master’s in computer science from the University of Chicago. In his early years, Greg Mader invested much of his career implementing and coordinating real time enterprise technology suites, technology and integration consulting, and database management for the government, military and commercial organizations. In 2012, Greg founded Ursa Information Systems, and after considerable growth and driven by industry convergence, changed the name to Open Source Integrators (OSI) and created three other specific divisions (USAodoo.com, HadoopIntegrators.com, and MagentoIntegrators.com) to more specifically address the needs of the changing and growing Open ERP industry. Open Source Integrators was the first Odoo Gold Partner in North America and Partner of the Year for the Americas. OSI focuses on helping businesses reduce risk and achieve their business goals by leveraging Odoo ERP and other complementary Open ERP technologies. Explore answers from Odoo experts to a variety of user submitted questions about Odoo, or propose a question of your own. Have a question? Our open source experts are here to provide answers! How do you calculate WIP in Odoo? Configured to real time accounting and inventory (not periodic). Manufacturing is installed, with routings of workstations configured. You have accurate product definitions, including raw material costs; costs for intermediate products; and finished goods. Anglo Saxon accounting is installed and selected (this happens automatically with recent versions of Odoo). Work in Progress (WIP) is the value for the goods that are currently being manufactured. Asset accounts need to be configured in the Balance sheet side of your General Ledger to reflect how you actually make things. If you have two work stations in your manufacturing routing, there should be two WIP accounts on your balance sheet. Additionally, accounts should be added to reflect the activity and movement of goods, and the value added throughout the process. This is called “cost flow”, and it is useful to brush up on the concepts of this prior to starting. For a more detailed explanation, please check out Financial Accounting with Odoo. I'm an IT Manager researching ERP solutions for my company and I am interested in using Odoo, but my team is concerned about the level of development needed to make the software work for us. Would we be better off integrating Odoo in such a way that our current Accounting package still looks after Finance and Odoo does the rest? Although it is possible to use Odoo without using Odoo Accounting, we never recommend this to our customers. Odoo Accounting is the foundational module of Odoo through which all critical business functions flow. We encourage customers to spend more resources upfront to configure and customize Odoo Accounting to avoid redundancy, confusion, and inefficiency in the future. Financial Accounting with Odoo is a valuable desk reference manual for Odoo users and for anyone considering implementing Odoo. Do you have the book in pdf version? Although Financial Accounting with Odoo is not available in pdf, the book can be purchased here. If you are an OSI customer that needs help on any subject matters covered within Financial Accounting with Odoo, we will get that information to you. I am considering using Odoo for my financial accounting system. I am attracted to the integrated, complete accounting approach for my tool manufacturing company. But, I am concerned about finding an accountant that knows how to use it. Are there accountants with experience in Odoo? Yes! We have worked with a number of top quality solo practice accountants in the US and Canada. We are happy to provide references and introductions to these talented people who can help with Taxes, audits, and special situations. I have a medium-sized food manufacturing business. We have a lot of raw materials that we need to manage closely, to keep waste and spoilage down. Does Odoo track Work in Progress and Inventory in general? Yes! USAodoo’s method of configuration will give you real time valuation of your raw goods as well as your goods that are being processed at each step of the operation. An Odoo system that is set up correctly can also track date codes and lots for the same goods, giving you a complete picture of your inventory. Additionally Odoo can use LIFO or FIFO inventory methods; these are commonly used in the food processing industry. Hi, I need to migrate five years of Microsoft GP accounting to a new system. Can this be done easily? USAodoo has a number of successful migrations from Microsoft Dynamics GP, SL, and NAV, as well as SAGE, and SAP B1. These legacy systems are expensive and hard to manage. USAodoo’s approach is to simplify the data migration, ensuring accurate reporting, and plan a successful, clean cut over. Can Odoo meet GAAP accounting principles? Will Odoo pass an external audit? Yes. Odoo can be configured for GAAP, IFRS, or other accounting approaches. USAodoo has set up Odoo for a number of Fortune 1000 companies in this manner. Similarly, Odoo configured correctly has successfully passed audits when implemented correctly. How much does the book cost and how can I get a copy of the book? The book can be ordered online through Amazon.com. Just click on one of the links on this page to view current pricing. Will the author of the book call me directly to discuss my challenges/opportunities? Yes. Greg Mader, the author of Financial Accounting with Odoo, and President of OpenSourceIntegrators.com and USAodoo.com is pleased to speak with anyone who has a need or interest in pushing Open Source Software to the next level for their companies. You can contact him from any of the contact forms on this website. Where can I find qualified integrators of Odoo software in the United States? Where can I get a copy of your Odoo accounting book? You can find the best and only step-by-step guide to Odoo software and its accounting module on Amazon.com. Just follow the links on this page. Can I use my existing salesforce.com installation with Odoo or do I have to go all in with Odoo to incorporate the Odoo accounting modules? Yes. With the right Odoo integrator, your company can harness the capability of SalesForce AND the power of Odoo. Here is a link to some of the thinking behind a hybrid Odoo software Implementation. Open Source Integrators is a trademark of Ursa Information Systems Inc.